Discussion in 'VaporJoes USA' started by VaporJoe, Nov 5, 2018. This box comes in six unique, fun colors, and the interface couldn’t be simpler; one large fire button on the top, and two small settings buttons on the bottom. A one-inch display ensures that you always know what’s going on with your vaping device. The ergonomic design means that it will fit in your hand beautifully, and give you a comfortable, spectacular vaping session. 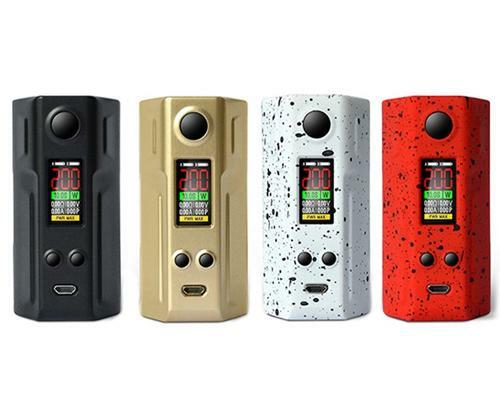 Despite being small and light, this is still a powerful box mod; it’s got an output range of up to 200W, which means it is a strong contender with other devices. It’s a bright, colorful mod that will definitely be an eye-catcher! So elevate your vaping experience with the Laisimo Spring 200W Box Mod! Your back and shoulder will thank you since you’ll be carrying around less weight with this mod. It’s a stellar addition to any vaping kit!